The iPhone 5c is here! Last week I got my hands on one briefly during a press event at Apple's campus, but now I've had a bit more time to study the colorful new iPhone models. A full review will need to wait for a whole lot more quality time with the product, but here are some of my first impressions. I ran a bunch of speed tests on the iPhone 5c, and as you might expect, they all showed pretty much the same performance as last year's iPhone 5. That's because the internals of the iPhone 5c are essentially the same as those on the iPhone 5. But here's the thing. The iPhone 5 is fast. It was a huge leap in performance over the 2011 model, the iPhone 4s. Someone upgrading from an out-of-contract iPhone 4 or 4s is going to be blown away by the longer screen and speed boost, even if the iPhone 5s is now the reigning speed champ. The most noticeable update to the hardware specs of the iPhone 5c is a new front-facing FaceTime camera. I doubt there are very many people thinking, "You know, I wish other people could see a little bit more detail of my face during video chats." But I did take pictures with my trusty old iPhone 5 and the new iPhone 5c, and it's true--the 5c's front-facing camera does indeed generate clearer and more detailed pictures. Of course, people forced the iPhone to be more than monochromatic by wrapping their phones in colorful cases. But the iPhone 5c doesn't need a case to give it personality--its color does that. The plastic back doesn't feel cheap or crummy, it feels solid. It's shiny and attractive, if slightly larger than the iPhone 5. In fact, comparing it to an iPhone 5, it feels like an iPhone 5 wearing a very thin (and colorful) shell of a case. Maybe the "c" in iPhone 5c stands for "comes in its own case." In any event, it's a handsome device. 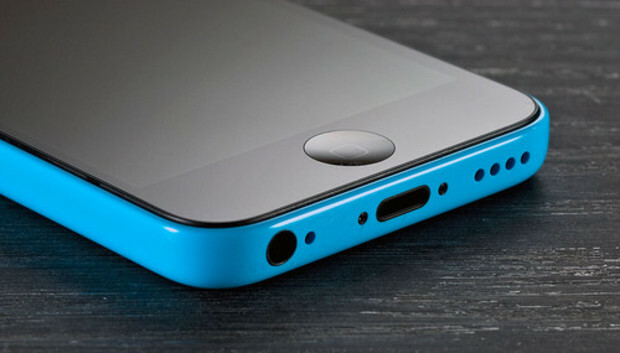 Apple is making a $29 silicone case as an add-on to the iPhone 5c. I can appreciate the effort: People do love iPhone cases, and Apple wants in on that action. It's also the only iPhone case you can legally buy that's embossed with the actual Apple logo. Aesthetes can quibble about the case's dot pattern, which exposes the iPhone 5c's color while also masking the phone's label so that "non" or "hon" shines through. I don't love the case (and the yellow one I got felt strangely muted--I wanted a yellow that screamed), but I don't need to get to its flaws. I just don't think the iPhone 5c needs a case. It sort of cries out not to have one, in fact. If you need to protect your iPhone, get a protective case and feel more secure knowing that your phone's protected. But when I see the iPhone 5c, hold it in my hand, and put it in my pocket, it feels perfect without the case. There's more to say about the iPhone 5c, but we'll need to spend some quality time with the device before it's time to give it the full review treatment. In the meantime, stay tuned to this site for plenty of iPhone and iOS 7 coverage. And don't miss my first impressions of the other new iPhone, the 5s.